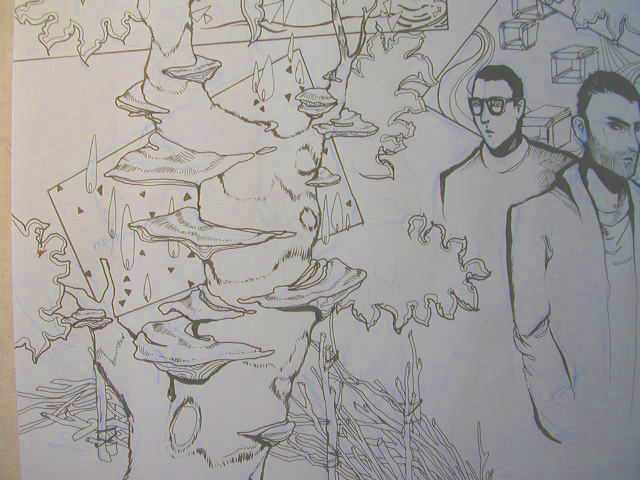 in regards to terry’s comment on my latest entry … the last chapter of graylight seems to have a different type of mushroom on every page (here, featuring page 126 with tree shrooms). i didn’t consciously make it so, but the two male leads are walking through a forest, and shrooms being one of my favourite elements of forests i guess it’s natural. i sat on the ground outside of the studio today, drawing. it’s so sunny and bright my head hurts. that’s how scandinavia is … we’re all awake through the winter but with spring sun it’s still as if hibernation is finally over and there’s all this vigorous talk and experience of everything sensual. beauty.